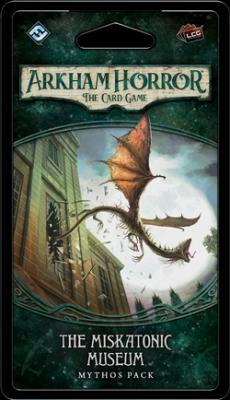 HomeCard GamesArkham Horror The Card GameThe Miskatonic Museum Mythos Pack: Arkham Horror LCG Exp. The Miskatonic Museum Mythos Pack: Arkham Horror LCG Exp. It begins with a book… Somewhere in the Miskatonic Museum, Olaus Wormius’s Latin translation of a book called the Necronomicon lies hidden away, kept locked and secret so that those individuals who shouldn\'t gain access to it do not. When recent events at the university and the Clover Club lead you to believe that someone may now be searching for this strange and ancient tome—someone who should not be permitted to delve its secrets—you make your way to the Museum. The hour is late, and the front door is locked. But you know you must recover the book before anyone can access its arcane secrets for dark purposes.